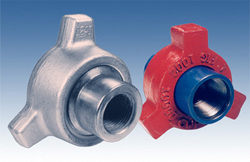 We are providing our clients with an exclusive range of Hammer Unions. Our efficient work force with the help quality raw materials manufacture these Hammer Unions in the standard range.Hammer unions for sour gas service are specially heat-treated for controlled hardness and utilize fluorocarbon elastomer seal rings. Matl. SS 304 - 500 Nos. Matl. EN 19 - 500 Nos. Matl. EN 8 - 500 Nos. Looking for Oil Fields ?